25 January 2019 (Toronto, ON) - Sarah McCoy went from playing piano and singing in hotter-than-hell New Orleans dives to appearing in-front of enthusiastic crowds in hip Paris night clubs. Now, with her Blue Note album debut, she carries on a tradition perfected by the likes of Tom Waits, Amy Winehouse, and Janis Joplin, who turned their complicated lives into dark but beautiful poetry and music. 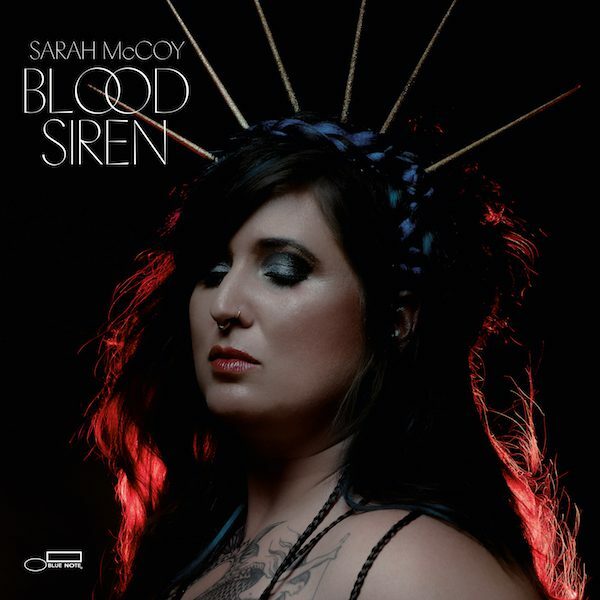 BLOOD SIREN released via Blue Note/Universal Music Canada, the country’s leading music company, perfectly captures Sarah’s haunted moan, a sound that both chills and touches the heart. Producers Chilly Gonzales and Renaud Letang create a stark midnight atmosphere with Sarah on piano and guitar, touches of cello and celesta, some electronic sounds, and plenty of silence, along with a voice that sounds just as it does when she’s alone in her room. Sarah McCoy was born in a New York outskirt. When she was a child, the family moved to the warmer climate of Charleston, South Carolina, where she had to face the deaths of both her father and grandmother, just a few days apart. Her salvation was a piano. Sarah studied classical music, then began writing songs that reflected her dark and somber state of mind. In her late teens, she says, “I discovered I could sing while trying to keep myself awake behind the wheel.” Teenage Sarah was an introverted oddball who dressed in black and warred constantly with her mother. Before turning twenty she hitchhiked to California. Armed with a guitar, she began busking in San Diego. During a stretch of couch-surfing and squatting in abandoned buildings, she proceeded to Monterey, where she settled for four years, did more busking on the streets; played piano in a bar “in exchange for quesadillas”; worked other survival jobs; and lived in vans. In 2013, French film director Bruno Moynie discovered her at the Spotted Cat Cluband enthusiastically not only shot a film documentary on her, but also arranged a concert tour of France. The success there initiated a French career for Sarah, who travelled back and forth from New Orleans to Paris on a regular basis from now on. In April 2017, Sarah opened in Paris for Jarvis Cocker and Chilly Gonzales who were launching their mutual Deutsche Grammophon album Room 29. Chilly Gonzales invited her to do a test recording the following afternoon with his producer friend, Renaud Letang (Feist, Manu Chao, Seu Jorge, Jane Birkin, Jamie Lidell). That October, Sarah moved to Paris. In February 2018, she, Gonzales, and Letang recorded Blood Siren, a captivating album full of striking details. On “Someday” and “Mamma’s Song,” Sarah’s playing takes on an eerie toy-piano sound that underlines the songs’ childlike despair. “The Death of a Blackbird,” a piano solo, is the sound of loneliness; it bespeaks her early classical training. “Devil’s Prospects” is a tale of New Orleans voodoo; it reeks of gin and dank, clammy night air.